Hitting the Jackpot vs being Hit by a Meteor? In February's What are the Odds? I'll check out which is more astronomical - hitting the jackpot or getting hit by a meteor? Are the odds of winning a Eurojackpot top prize quite as astronomical? This is a tricky one - yes, you would have to be tremendously lucky to win a jackpot at a lottery, and more so in one as popular and huge as the trans-nation Eurojackpot. Those odds have been calculated at a highly elusive 1 in 95,344,200, but then, you are betting on prize stakes as high as £80 million, and the same cost can also win you prizes across 12 more tiers with progressively better chances of returns. But, are these odds comparable to the almost unheard –of event of being hit by a meteor? Let’s find out! If you thought Eurojackpot is a distant shot, being hit by a meteor is even more so (and quite literally so!). Also, the calculations should consider being hit alone versus being killed – since an asteroid can still land with enough impact and generate strong enough heat/ blast wave to destroy life within a 100 km radius – and it can still not fall directly on anyone. This is the simplest of the lot. It assumes that about 500 meteorites strike the Earth each year on average. And then simply calculates the odds of an average house of size 2500 sq ft being ‘chosen’ out of the whole wide expanse of 5.49 quadrillion sq ft for a targeted house-collision by any of the 500 meteorites in a year – which comes to 1 in 2,196,267,379,587 any year. For an average life-span of 80 years and 40,000 meteorites, that is still less at 1 in 176 trillion! This skims over the issue of whether or not you are actually inside the house when the event happens, which would give us even lower odds. And 2500 sq ft is actually an awesomely big house to have, folks in cities live in apartments far smaller than this – add to it the complexity of multiple storeys etc. This assumes Murphy’s Law, that if something can go wrong, it will. So, you can get hit by a meteor standing anywhere on the surface of the Earth. So, assuming the Earth has a surface area of 510,000,000 sq km, of which land accounts for 150,000,000 sq km and that a person occupies at least a sq meter (.000001 sq km) of space at any given time, that gives us a possible human casualty ‘universe set’ area totalling 150,000,000,000,000 sq m (150,000 bn). Now, if we assume a population of 7 bn spread out over this maximum possible casualty area, that gives us a (7 bn sq m/ 150,000 bn sq m) chance or a 1 in 21,000 chance that there would be at least one person occupying a particular sq m at a given time which is likely to be hit. Assuming any one of the 500 meteors can hit the place in a year, and assuming an average human lifespan of 80 years with 40,000 possible personal meteor collisions, the probability of getting hit by a meteor once in a lifetime is 1 in 40,000. That can compound the odds of being hit by a meteorite in a lifetime to (1/21,000)X(1/40,000) or 1 in 840,000,000. NASA maintains a risk table for all ‘Near Earth Objects’ that calculates their likelihood of impact for the next 100 years, where asteroids are plotted on the Torino Scale of 1 to 10, with 1 being the least risk-point and 10 the maximum. Currently, nothing on the table is above a 1, which means an actual impact is calculated as ‘extremely unlikely’. So, large-scale death by asteroid can be pretty much checked off the list. The biggest risk is from Asteroid 2011AG5, which is 140 metres across and has a cumulative impact probability of around 2% between 2040 and 2047. Since the Hodges incident, there have been very few accounts of individuals struck by a meteorite. In 1992, a boy in Mbale, Uganda was hit in the head by a 3-gm fragment of a meteorite after bouncing off a banana tree. A German teenager got a small burn from a pea-sized meteorite in 2009 before it bounced off and created a tiny crater on the ground. If those odds are still not enough to put your worries to rest, take extra precautions to ensure you are absolutely asteroid/meteorite safe. So, keep an eye out for asteroid passing news and dates of meteor showers – and stay indoors. And sleep standing up to minimize the surface-area you occupy, just kidding! Or if you get put off by the lottery jackpot odds, and think you stand to gain better being hit by a meteorite and selling it off for a pretty penny, you might choose to stand on the roof on these occasions and wait to be it by space-rock! But don’t say we didn’t warn you - the lottery’s a better bet. Anne Hodge’s freak non-fatal meteorite hit apart, there has been nothing in documented history that points to death by celestial accident. Sure, the dinos got mass-wiped out (that was good for us though, right?) in an alleged asteroid collision a billion years ago, rubble from aborted/unsuccessful satellite and space missions have been known to fall back on Earth, an asteroid did land in Russia in 2012 and injured some 1200 people indirectly on impact. Shooting star events and small burnt-out rock particles from outer space enter Earth every day and are reduced to harmless star-dust every day. 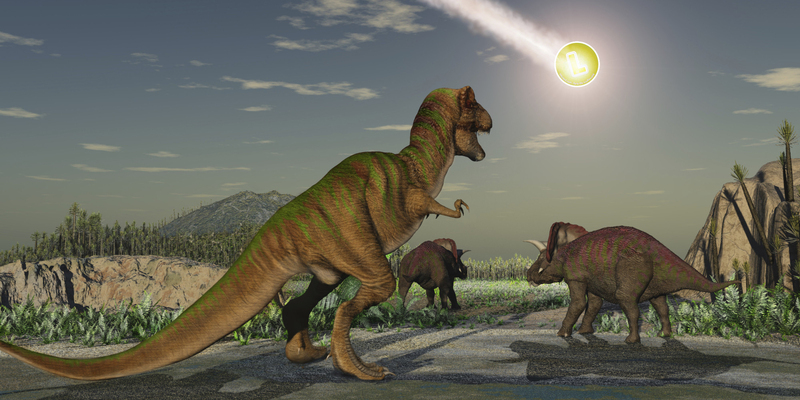 A meteorite hit that injures or kills, however, is an extremely rare phenomenon – and that is understating it by a very long shot! At least, lottery jackpot odds can be calculated with simple and straight-forward mathematics, and involve not even a fraction of the mind-boggling T&Cs or the infinite number of threats and possibilities that come into the picture for a statistical likelihood calculation of an asteroid hitting or killing an Average Joe. It’s a much better proposition to be inspired by odds that positively reinforce life and luck, than get troubled by far-fetched speculations and morbid doomsday thoughts which you can hardly do anything about. Better to pass on the scary hit-by-meteor number-crunching to the government guys and hope that our scientists get enough funding to bring those odds down even more.